Calahonda, or Sitio de Calahonda to give it its full name is a large property development on the Costa del Sol between Fuengirola and Marbella. While initially just a property development, Calahonda has grown so much that it could now qualify as a town all on its own, but to be exact, it is part of La Cala de Mijas on the Mijas Costa. The residents are predominantly of English and German nationality and there are many lovely holiday apartments and villas in the area, perfect for holidaymakers wanting to be a little independent. To this end, Calahonda offers three commercial centres offering around 45 cafeterias, pubs and restaurants, several handy supermarkets and a variety of other small businesses. There is a chemist on site as well as three medical centres offering 24 hour service in case of emergencies. Close by and further down the coastal highway, the Costa de Sol Hospital offers excellent medical facilities. Calahonda offers the best of both worlds, with a rural flavour combined with a coastal, beach resort lifestyle. Between the various properties there are large green areas, making it an attractive and pretty place to be. 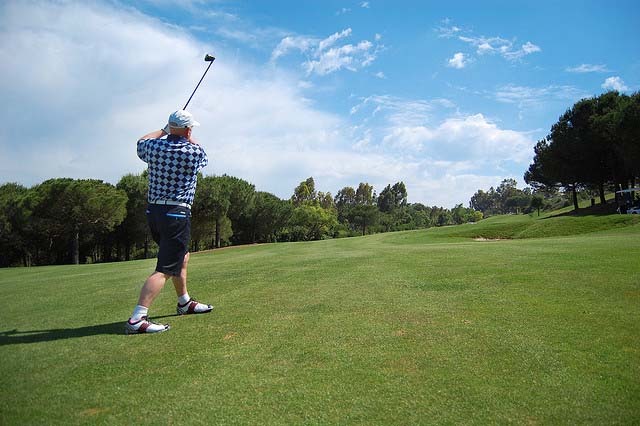 Among those green areas there are, in total, 10 golf courses within a 10 kilometre radius, making this the perfect destination for the keen golfer. For those preferring to stay in a hotel, the Crown Resorts Complex, which covers five separate sites and is linked by a free shuttle bus, has plenty to offer. There are several sports options available, including tennis, squash, volleyball and mini-golf, as well as spa and swimming pool facilities. The resorts offer playgrounds for the children with suitable pools and mini clubs where an entertainment programme is available. The beach is across the highway from the residential area of Calahonda, offering a selection of services including water sports, beach chiringuitos (restaurants and bars) and a beautiful stretch of sand, lined with attractive vegetation and a rocky outcrop. For those keen on fishing and diving, there is a wooden jetty available. Within easy reach of Calahonda, the coastal highway takes visitors for a shopping visit or evening of entertainment in Marbella in one direction. Drive a little further and visit Estepona, a charming, typically Spanish seaside town with a fishing and entertainment marina. Even further will take you to the British enclave of Gibraltar, great fun for a day out. Going the other way, Fuengirola has a lot to offer visitors including the Bioparc Fuengirola. The Mijas Costa area offers many beach towns as well as the Mijas Water Park with lots of fun to be had by young and old. Heading inland, Mijas Pueblo is a charming white village which is definitely worth exploring during a holiday in the area, with several interesting museums, shops, restaurants and pretty streets to explore. Heading further down the coast in the same direction, a visit to Malaga city is an ideal day out with plenty to see and do, including museums, art galleries, shopping centres and so much more. Try Calahonda for your next holiday and have a great time on the Costa del Sol.